This isn’t an original recipe, though I admit to forgetting where I first saw it, and even what the original ingredients were! Like many recipes I like, I end up modifying them, making substitutions and trying different combinations of things. If I make the dish more than once, this helps keep things fresh and interesting. If I prefer to leave out an ingredient, it keeps the recipe viable. Sometimes I throw in something new, just because I like it. As I mentioned in my Instagram post, I could eat hearts of palm forever, so I tend to put them into a lot of dishes I make. 3, 15-oz cans of beans. I like to mix colors, so I used: red kidney beans, white beans, and black beans. I don’t tend to use chickpeas (garbanzos) for the “white” beans, although I suppose you could. I think it has to do with the size / uniformity of the types of beans when mixed together. 1 bell pepper, diced. I used red here, but you could use orange, yellow, or green also. Scallions (green onions) or a 1/4-1/2 a diced red onion. A little cilantro (chopped fresh or sprinkled dried, if you like it). If you don’t, try flat or curly parsley! Empty a can of beans into a strainer and rinse with clean water. Then put into a big salad bowl. Repeat with the remaining cans. Strain any liquid from the other cans and add them to the bowl. Toss in everything else–that’s it! 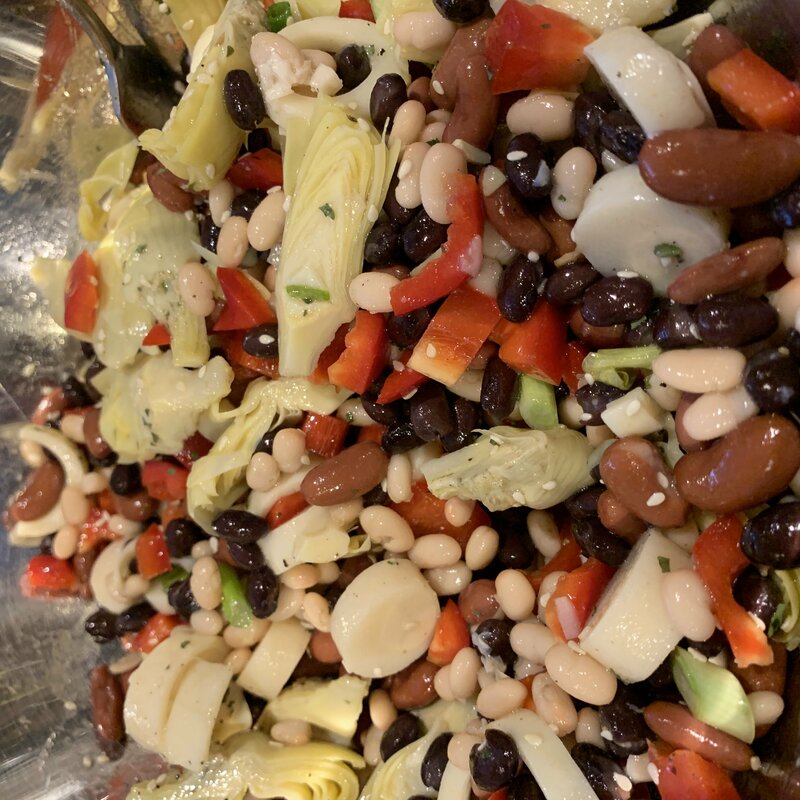 I enjoy this salad room temperature when I first make it, and because it marinates after you add the ACV and the EVOO, it can taste even better the next day. If you can tolerate them, beans are a good source of protein that will help you feel full. That said, I sometimes eat less salad, but add sliced avocado and/or some Tonnino tuna fish to this salad as well. Have a variation you’ve made? Let me know! Previous: Previous post: What does “being healthy” really mean?